In 1970, Steppenwolf hit a major home run with their double live album Steppenwolf Live. The extensive live concert album consisted of their hard rocking 60’s hits, popular album tracks, along with artist and fan favorites, performed live during their amazing 1970 tour throughout the United States. With Friday Music already being a home to other Steppenwolf masterworks like our Slow Flux/Hour Of The Wolf/Skullduggery deluxe cd set, we are very pleased to announce for the first time in North America, the official 180 Gram Audiophile 2 LP Vinyl release of their much revered concert album Steppenwolf Live.Produced by Gabriel Mekler, the 2 Lp masterwork features the stunning original hard rock line up of John Kay, Goldy McJohn, Nick St. Nicholas, Jerry Edmonton and Larry Byrom. Showcasing a plethora of classic Steppenwolf music on four sides of audiophile vinyl, the tracks are simply some of the finest from their classic 60’s-early 70’s rock era with smash hits like Born To Be Wild, Magic Carpet Ride, Monster, The Pusher and their hit single from the album Hey Lawdy Mama.Mastered impeccably by Joe Reagoso (Grand Funk Railroad/The Byrds/Johnny Winter), this limited edition Steppenwolf classic release will be presented in the original stunning gatefold cover art, not seen in years here since its first release on Lp.John Kay and Steppenwolf continue to be one of the world’s finest gifts to the classic rock world. Their powerful songs, their live show, the audience, their musicianship and unparalleled artistry are second to none. 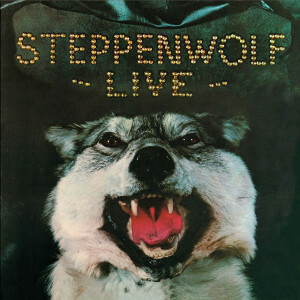 Steppenwolf Live proves that now and forever.Get Your Motor Runnin’…..